“This project transformed the previous austere institutional building. The old car park is converted to make high-value landscape and community spaces. The Enabling Village is a demonstration of heartland rejuvenation through adaptive reuse of the old Bukit Merah Vocational Institute / Employment & Employability Institute (e2i) in Redhill. The fenced-in site was inward-looking and did not contribute to the neighbourhood. The Masterplan conceives the Village as a new community heart and opens up the premise as a park to connect people with disabilities, residents and public. The new Nest building is anchored at the main pond and serves as a beacon, drawing pedestrian flow through the new linkways. 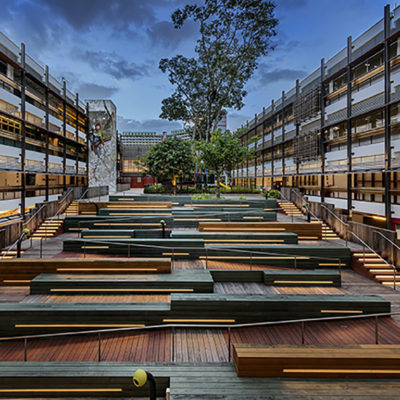 A timber terrace is laid over the courtyard at the Playground, stepping down as an amphitheatre with integrated ramps. 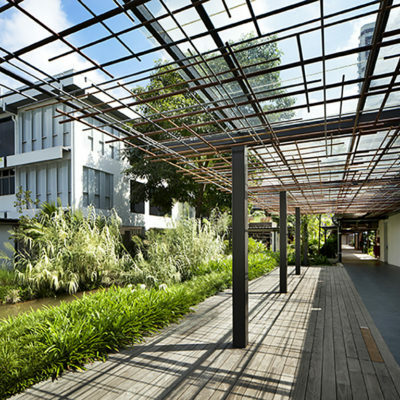 The terrace continues under and past the building as a balcony overlooking activity islands and as a garden trail connecting to the adjacent housing precinct. Pre-cast concrete pipes are inserted below the amphitheatre as resting nooks. The open space between the Village Green and the Hive is reactivated as a garden yard with re-purposed sea containers as bridges, follies and meeting rooms loosely scattered with recycled oil drum planters. 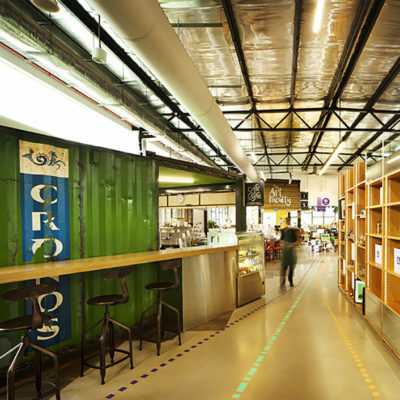 ‘Up-cycling’ continues as interior design features in the Art Faculty and Hive. 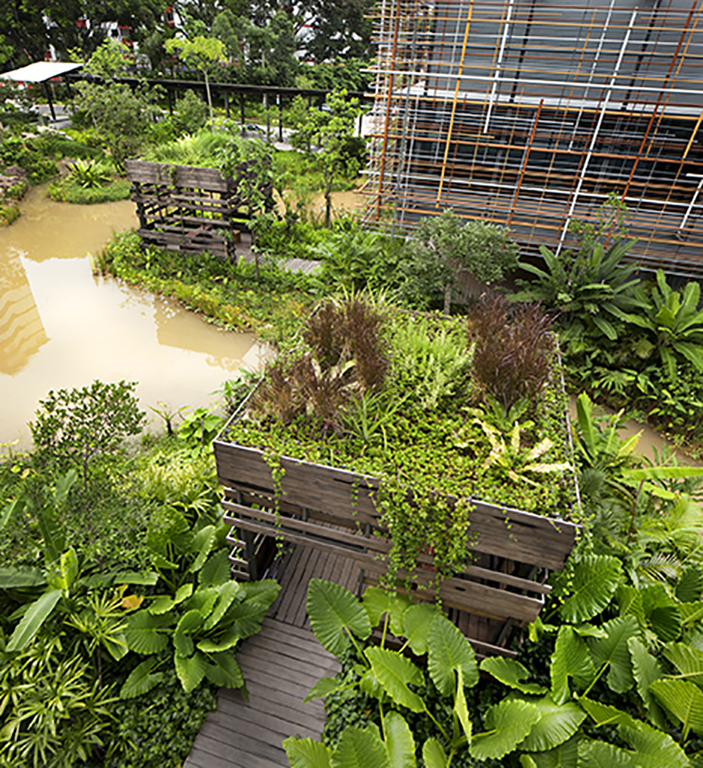 Landscaping and water gardens are designed with a variety of native species, scales and colours, complementing the conserved trees to attract biodiversity and support ecosystems. Verandahs and cabanas extend out from passages as outdoor meeting spaces, bringing nature closer to people. The porous and accessible nature of the Village creates an inclusive environment, integrating people with disabilities as equal in the community.